^ The others were his foster brother David Dixon Porter, George Dewey, William D. Leahy, Ernest King, Chester Nimitz, and William Halsey. ^ Farragut, Commander D.L.. Report from the Naval Testing Battery at Old Point Comfort Va, a journal book filed with the Bureau of Ordnance & Hydrography on August 31, 1853. ^ Memory Alpha, USS Farragut (NCC-60597) mentions the fictional starships commissioned under the name Farragut. Adelson, Bruce (2001). David Farragut:Union Admiral. Barnes, James (1899). David G. Farragut. Farragut, Loyall (1879). The life of David Glasgow Farragut, first admiral of the United States navy: embodying his journal and letters. Hickman, Kennedy US Military History Institute. 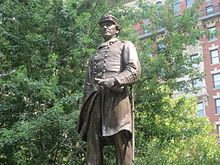 “Admiral David G. Farragut: Hero of the Union Navy”. Houston, Florence Amelia Wilson; Blaine, Laura Anna Cowan; Mellette, Ella Dunn (1916). Maxwell History and Genealogy: Including the Allied Families of. Mahan, Alfred Thayer (1892). 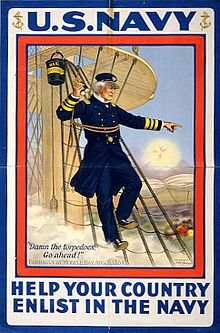 Admiral Farragut. Shorto, Russell (1991). David Farragut and the Great Naval Blockade. Soley, James Russell (1903). Admiral Porter. Spears, John Randolph (1905). David G. Farragut. Stein, R. Conrad (2005). David Farragut: first admiral of the U.S. Navy. Anderson, Bern (1989, 7th printing). By Sea And By River. Fowler, William M. Fowler (1990). Under Two Flags: The American Navy in the Civil War. Tenney, W. J. (1867). The Military and Naval History of the Rebellion in the United States:.